What to do if a neighbour’s tree is affecting you or your property? We are the only tree experts in Brisbane North! We’re called North Brisbane Trees for lots of good reasons and the #1 reason isn’t JUST because we’re based in Samford, in Brisbane North! Time to break out the firewood! Brisbane is known to get a bit chilly and as it’s now May, temps at night are close to single digits – which is cold by our standards! If you’ve got a fireplace, then you know the great warmth that a good old fashioned fire can bring. And it’s quite nice to watch while you sit back sipping away at a hot mug of cocoa (or whatever your drink of choice is!). Of course if you’re a keen camper or have a big property to light up a camp fire or bonfire, you’re already a fan! 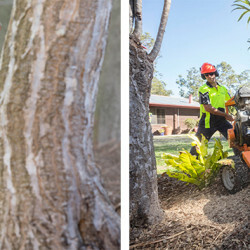 You already know that North Brisbane Trees are the affordable tree experts in Brisbane who pull together a team of highly qualified professionals to get the job done right every time. But we’re more than just a bunch of ace tree loppers. We’re also stump grinding masters. And here’s why that matters. Welcome to 2017 and we hope you had a great time over the holidays. Interview with Craig Bauer – Brisbane’s #1 tree expert! When it comes to people in the tree services industry, Craig Bauer has a wealth of knowledge and experience from everything relating to equipment to trees. His undying passion is a driving force behind the success of North Brisbane Trees so we caught up with the man himself to learn more about what makes him the best of the best in the Brisbane tree services world.